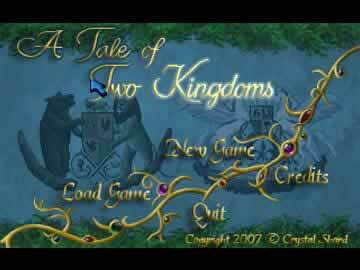 A Tale of Two Kingdoms Game Review - Download and Play Free Version! The Kingdom of Theylinn needs an adventurous hero - are you up for the challenge? Magical kingdom is well developed, including fairies, wizards, druids, goblins and more! Non-linear structure that allows tasks to be completed in any order, and allows user to control their movement through the kingdom. Mini-games are a part of the main plot. Graphics are very pixelated which sometimes makes it difficult to distinguish among items on the screen. Step into a world of epic fairy tales. 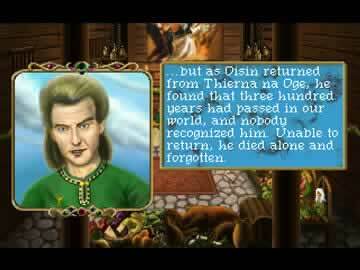 A Tale of Two Kingdoms is a fantastic adventure game made in the style of such venerable classics as King's Quest. Meanwhile, danger approaches, in the form of an invading army, a hostile giant, and a mercenary troop who are ancient enemies of the Theylann king. And there is mystery yet. For hidden within the borders of Theylinn lies a second kingdom, named Thierna na Oge, where the faeries reign. Little is known about this shrouded, exotic realm. The playing atmosphere is full of magic and intrigue which is accompanied by a rich storyline and a great soundtrack. 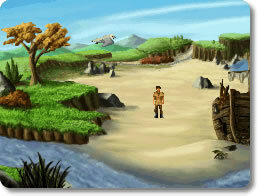 Overall this game is a very polished effort and a worthy tribute to classic adventure gaming. This critically acclaimed game also features five different endings; multiple side quests and alternative solutions; teamwork mode with other characters; and even a director's commentary! A Tale of Two Kingdoms hearkens back to adventure games of old when the level of difficulty was greater because the hints provided by the game were fewer, offering more of a true adventure to the player. However, the challenge presented here is not so great that it is only recommended to the more experienced gamer as even the most casual of players will enjoy traipsing about the kingdom of Theylinn. The Way Adventure Games Used to Be - No Hints! While there is no hint system to offer help in times of trouble, the rudimentary point-and-click design of Two Kingdoms is such that items or areas that are necessary to explore typically stand out from the scenery, such as a barrel of apples near a shed, making it relatively simple to spot a necessary game component. Don't be fooled into thinking this ruins that challenge though. Expect to frequently be caught off guard by rogue wizards and hideous goblins, veiled assassins and mythical fairies who will abruptly alter the course of the game by cursing you (causing inverted mouse movement), trapping you, and even killing you which restarts at the previous save point. Mini-challenges are a part of the game itself, such as finding a way to earn money or learning how, or who, to remove the curse placed on you by the wizard. The graphics themselves are well detailed which is only apparent in close-ups during dialogue. Most scenes are too pixelated, frequently making it difficult to spot an item before looking at it closely. Overall, A Tale of Two Kingdoms earns a score of medium for difficulty because many of the tasks are easy to figure out, but some do require serious intellect and thought to solve. Both casual and experienced gamers alike can enjoy this mystical world and while some areas could be improved upon, this freeware is worthwhile to adventure fanatics and new players alike. Watch a short clip as Lord Maeldun visits with a few of the characters which you can interact with in this point-and-click adventure.